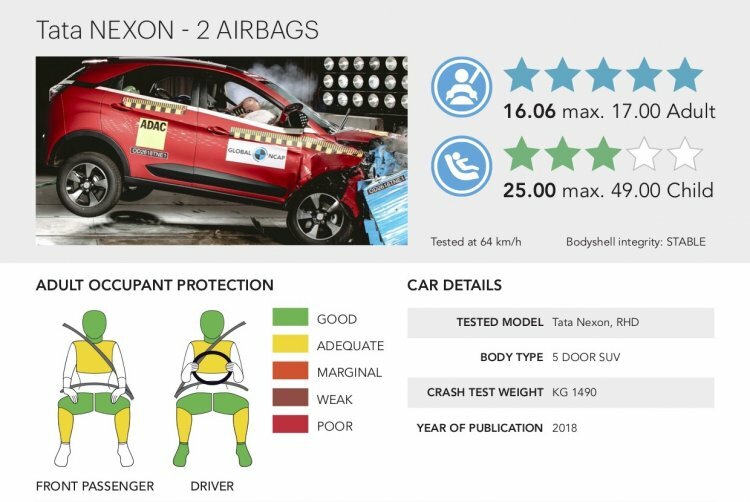 The Tata Nexon’s safety rating from Global NCAP has gone up from 4-star (in Adult Occupant Protection) to 5-star. This is the first-ever maximum safety rating from Global NCAP awarded to a vehicle made in and made for India. 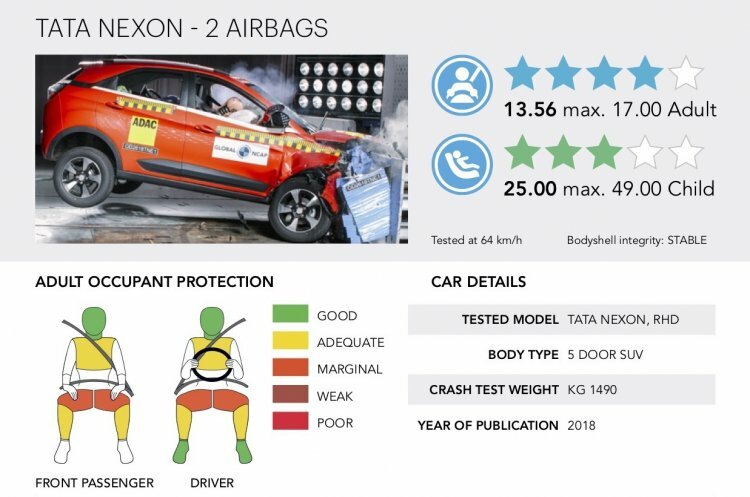 Global NCAP has changed the grade for the driver and front passenger's knee protection in the Tata Nexon from 'marginal' to 'good'. Following the 4-star rating earlier this year, Tata Motors improved a number of features of the SUV. The revisions included making a Seat Belt Reminder (SBR) for the driver and front passenger standard. When Global NCAP had given a 4-star rating (in August 2018), it remarked that the driver and passenger’s knee could impact with dangerous structures behind the dashboard which is supported by the Tranfascia tube. The knee portion of the driver and front passenger after the crash testing knee had ‘marginal’ protection. The Tata Nexon had previously received a 4-star safety rating from Global NCAP. Now the safety agency says that the driver and passenger’s knee have shown ‘good’ protection. Also, the sub-compact SUV was required to pass a side impact test meeting UN95 side impact protection requirements. The Tata Nexon’s score in Adult Occupant Protection has risen from 13.56 points to 16.06 (out of maximum 17), resulting in the upgrade to the highest star rating. There’s no change in Child Occupant Protection: 25 points out of maximum 49 (3-star rating). The Tata Nexon’s prices start at INR 6,22,802 (ex-showroom Delhi) and go up to INR 10,66,637 (ex-showroom Delhi). The wait is now on for India's second vehicle to achieve the top score.